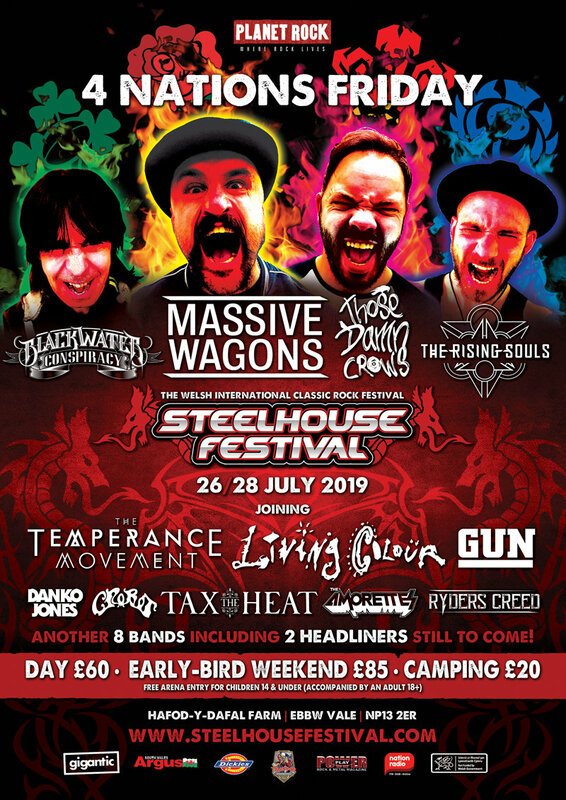 Steelhouse Festival has announced the full bill for its opening night, on Friday 26 July. Taking inspiration from the impending Six Nations tournament, the opening exchanges at Steelhouse 2019 will take place on ‘Four Nations Friday’. Each band will take to the stage representing their own proud nation. Playing with the benefit of home advantage, Those Damn Crows will carry the hopes of all Welsh rock fans. Kicking it down the throat of the opposition and getting the games underway is Northern Ireland’s Blackwater Conspiracy. Scotland’s charge for the line comes from The Rising Souls whilst English hearts and Grand Slam dreams lie with headliners, Massive Wagons. Whose set will be hailed as the greatest? There’s only one way to find out (well, after Ireland slaughter everyone else at the rugby again this year!). Friday night is the Steelhouse’s “free” evening for weekend and day ticket buyers. That’s an offer that cannot be matched – not least when you realise that the full price for the whole Steelhouse weekend costs the same as just 80 minutes of international rugby… three days of blood, guts and passion for under 100 quid. Steelhouse takes place at Hafod-y-Dafal farm, outside Ebbw Vale, from Friday 26 July – Sunday 28 July. Other acts confirmed over the weekend are The Temperance Movement, Living Colour, Gun, Danko Jones, Crobot, Tax The Heat, The Amorettes and Ryders Creed. Tickets are available HERE. NextGreta Van Fleet: Wave Of The Future or Marmite Band In A Nostalgia Niche?